Baseball signed “Al Dark” by Alvin Ralph Dark (1922-2014), nicknamed "Blackie" and "The Swamp Fox", was an American Major League Baseball (MLB) shortstop and manager. He played fourteen years for five National League teams from 1946 through 1960. Dark was named the major leagues' 1948 Rookie of the Year after batting .322 for the Boston Braves. Very good condition...plus; Baseball signed “Joe Sewell” by Joseph Wheeler Sewell (1898-1990) was a Major League Baseball infielder for the Cleveland Indians and New York Yankees. He was elected to the Baseball Hall of Fame in 1977. Sewell holds the record for the lowest strikeout rate in major league history, striking out on average only once every 63 at-bats, and the most consecutive games without a strikeout, at 115. 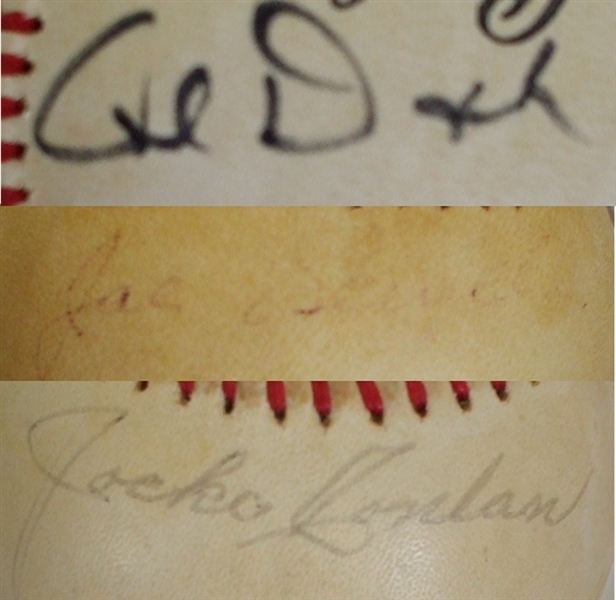 Light signature, good condition...plus; Baseball signed “Jocko Conlon” by Arthur Joseph "Jocko" Conlon (1897-1987) was a professional baseball player for the Boston Braves in Major League Baseball. Conlon was an alumnus of Harvard College, class of 1922, where he captained the Crimson baseball team.